I usually have pepperoni or sausage or sausage and pepperoni pizza. Probably because most of the time that I have pizza is at some sort of social gathering. I do like other toppings. Pineapple and ham is great. Chicken and onion is a favorite. A plain cheese pizza is a very versatile delivery unit for many different flavors. The one that freaks people out is when I make my own pizza and top it with broccoli and rice. Thats awsome some one should do that in real life and take a picture of it so we can all see it. Biff will make a killing selling that. I just realized how hungry I am…mmm, pizza-crane. And if you mess it up, you can just eat it and start over with a new piece! Well, at least he found a good use for all that pizza dough from yesterday. I miss the old comics, when they were realy random. Sure, pizza origami is good but #2 beating a grease fire with hammers, now thats good! 1) Before we started Weight Watchers, my wife and I would put tater tots and frozen corn on plain Tombstone pizza and bake it up. It was de-lic-ious! 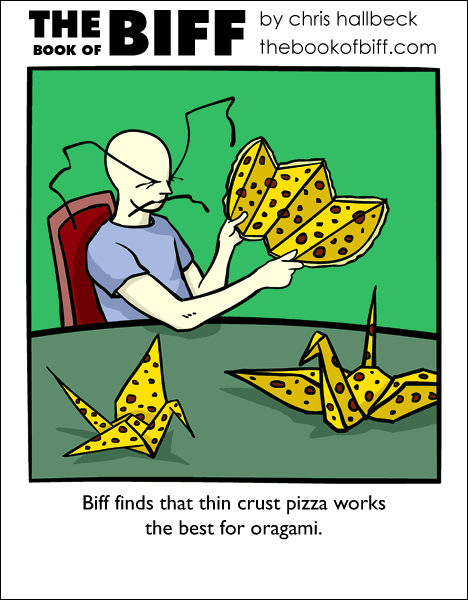 2) Six years ago I folded the top of a pizza box into a flapping crane for a friend of mine. He still has it after all these years. Man, I’d hate to see the result of when he tried DEEP DISH pizza. Hopfully he doesn’t fall asleep in this pile of collection that would just burn. i wonder if he will eat it or sell it? Finally! I have a use for pizza! I swear, I’m the only person in the world who doesn’t like it. I’m told that the melted cheese is the best part, but that’s exactly what I hate about it. Skydiving Solitare, a combination soda dispenser and clothes dryer, a breader, an immovable object, a way to eat cerial without it getting soggy, a shredder mailbox…Biff definitly sidelines as an inventor. I’m taking a wild guess that you have an unlimited supply of pizza jokes, right? So that’s where the damage came from when he was teaching pizza to fly. …this indie-film studio is preparing a film on the many & varied fields of research that are using Origami as one of their tools. You can also see a free trailer of this work-in-progress. On a different note, Little Ceasar’s Pizza used to have a TV-commercial in which the pizza-box was folded (by a live actor) into a flapping-bird (=traditional crane, without the skinnying folds). They, however, called it a “Pterodactyl”. I love making my own pizza. I haven’t made it in about a year, but it’s huge. Usually the toppings are mushrooms, fresh tomatoes, sun-dried tomatoes, fresh garlic, pepperoni, ham, sausage, chicken (fried in oregano and basil), bacon (fried in ground black pepper), and sometimes ground beef. I usually make two (each the size of a cookie sheet). Its an ordeal to make it, but it is delicious (won me a pizza-making contest at university) and you can’t eat it without a fork and knife because its so thick. I’m guessing no one ever told Biff not to play with his food…I think it’s great. I just ate a whole alfredo pepperoni pizza. Mission: DELICIOUS! Uh, so what’s with two pizza-related comics in a row? Is this like a theme week or something? Cause that’d be so awesome it makes me want to punch myself in the mouth…with pizza! Broccoli on pizza is amazing. Unfortunately, I only know of one pizza place that offers it as a topping. Mostly I just get weird looks when I ask. Been reading Biff for about a month now, but never commented before. Chris, you are a genius. I never knew there were so many uses for pizza…. I bet he cant make a rabbit. I challenge biff to make a rabbit!!!! taco sauce,pepperoni,bacon,classico pizza sauce, green pepper tabacso,spiced meat,and garlic dough,makes the best Mex-I-talian pizza. Is it just me or is this the first one where Biff discovers the right way to do something? Normally he’s discovering what not to do (20 parachutes, imovable object in washing machine… I’d have to re-read every comic to get a full list). Pineapple and ham?! Noooo, not another one! Here’s a mind twister. Pepperoni is the pizza topping most often on sale. Is it on sale so much because it’s the most popular, or is it the most popular because it’s on sale so much? If I owned a pizzaria, I’d do an experiment by never having pepperoni on sale to see if some other topping would be more popular. My favorite is Canadian bacon (ham) and ground beef. Many other toppings and combinations are yummy, but I can’t abide fruit or seafood on my pizza. Seriously, check out some of their toppings, especially if you’re into stranger tastes. My personal favourite is the Grimm… Spring onion, smoked chicken, cream cheese, apricot sauce, pine nuts, and rosemary. And, just in case you’re confused at one of the ingredients, capsicum is what we call (I think) bell peppers. I think that gives him a black belt in origami. Try diced banana on pizza. Make sure you cook it with the pizza though. It’s a lot better than it sounds. Waiter: Would you like your crane cut into 8 slices, or 10 sir? And pizza! I’m gonna go try that! Brocoli and rice actually sounds pretty good on a pizza… I mean I like it with cheese so I don’t see how crust and a bit of pizza sauce would hurt. Chicken is not a desireabe pizza topping for me however. I thought the ancient art of pizza folding was called “oregano”, actually. One thing you can do is take a triangular piece of pizza, fold it, put several squirts of Frank’s Red Hot into the fold. While it isn’t particularly artistic, it’s tasty. The best way to make Pizza is to put it on the braai (a type of barbecue, fueled by wood or charcoal). Man, you get that great smoky taste, as if you placed it inside your very own authentic pizza oven. But putting it on the braai is more fun, coz when someone lights it up, you automatically start pulling out the beers. Fun! I am completely inept when it comes to origami. I can never get the instructions right, and my fingers just don’t seem to work when I try to do that. Oh, and Kamorth – capsicum = cayenne peppers. I like anchovies, but everyone else hates them.